The month of April is Sexual Violence Awareness Month, and we thought it would be a great idea to sit down as a company with a friend of ours, Debby Tucker. Debby serves as the President of the National Center on Domestic and Sexual Violence. NCDSV is doing some great work, all with their fearless leader at the helm. The list of Debby's accomplishments is far too long to talk about in detail here, but visit the NCDSV website to learn about what she stands for. She visited our office today, and we got to know more about her organization; the many ways Bravelets and NCDSV can work together; and how we as a community, nay, a SOCIETY, can end domestic and sexual violence. When and why was NCDSV started? We started in October of 1998. We started because there was a number of us who, in many different ways, had been working on domestic and sexual violence for a very long time. And we realized that people were struggling to reinvent the wheel in local communities and state organizations...that there wasn't a way for them to advance very quickly beyond what we'd already learned. So how can we build training, consulting and a website that supports the end of violence? Instead of having to figure it out one by one? we thought. People say they have found the answer, what they needed [on our website] by looking at what we have. It is a very important vehicle to share information. What is NCDSV’s mission & core values? We seek to provide support to advance the movement more rapidly through training, consulting and advocacy. And we do love to rabble rouse. We love to be a part of the change. We CAN end [violence]. It's just going to have to come from a lot of different places and people. A commitment for change that impacts children and young adults now and the families they will have later, that's what will work. For anyone who doesn’t know, how can someone use NCDSV as a resource? First and foremost, run around our website and see if there is something you need that isn't there, because it might well be. The website is our most helpful resource. People are free to email me, dtucker@ncdsv.org. If they are a person who is looking for help for themselves or a friend because their partner is using violence, they can call the organization I used to work for: The National Domestic Violence Hotline, 1-800-799-SAFE. And if a person has been harmed sexually, whether at the hands of a family member, friend or stranger, she or he can contact the National Sexual Assault Hotline, 1-899-656-HOPE. If someone is sitting reading this, she or he will know that there are people out there who could help with my process of recovering from the violation. It is Sexual Violence Awareness Month, what is the one message you want to spread during this month? Most of the time, in these unfortunate situations, people turn to family and friends. So the better prepared we are as individuals to lend support and to be approachable is good. We need to make it so that anyone we know who has been hurt or damaged knows they can come to us. That is so powerful. We should be able to see someone, and if their actions or behaviors disturb us, we need to be courageous, be brave. We need to speak up to ask them to reconsider what they are saying or doing. If we are concerned for someone's safety then we must speak with her or him, and provide encouragement, support and information so they can speak up for themselves. What is one thing you would like someone who is or has experienced sexual violence to know? That you can heal. That you can get stronger over time. People need to know that they are not alone. [Sexual violence] is a horrific thing to experience, but like many horrible things, it opens your eyes to how things really are in the world, and it gives you a chance to know yourself and the world differently. It's bizarre that these horrible occurrences can be so revealing. But everyone takes his or her own time to recover. But you can recover. People need to know that they are not alone. People need to know that sexual violence is intentional, a choice one person makes to violate another, and it is never the fault of the victim. Do you have a particular story about NCDSV’s part in creating a positive impact in others' lives? I was the co-chair of the Defense Task Force on Domestic Violence, then I worked some with the Task Force on Sexual Assault in the military services. There are a lot of people who call the National Center on Domestic and Sexual Violence who don't fit into a local agency's services, they are confronting something that can happen anywhere in the world. And I am having dinner tomorrow night with a young women who was sexually assaulted while in the military. She spent a very long time at her parent's home because they just booted her out of the service when she came forward, said she was crazy. So, it was actually her father who called and said "she needs help." With her parent's help and support, we moved her forward and got her real counseling and ways to deal with the assault committed against her and the pain from lack of support. Eventually I got her to accompany me to Congress and share her story, and she is now a she is a student at Texas State University working on her Master's degree in Public Administration and is going to raise holy hell in the world. I am so excited for her. She is very ready to blossom. What is the impact of Bravelets donations with NCDSV? It has helped us to buy things that we had absolutely no funds for that we needed to do our everyday work. It has given us some flexibility. To know that they donation is coming in monthly is great. And it has also given us a reach to people that would have otherwise never had contact with. It's not just our friends and family buying the jewelry, it's people across the country choosing to support our organization. Your Brave Page for NCDSV has raised $720 since the beginning of 2016. 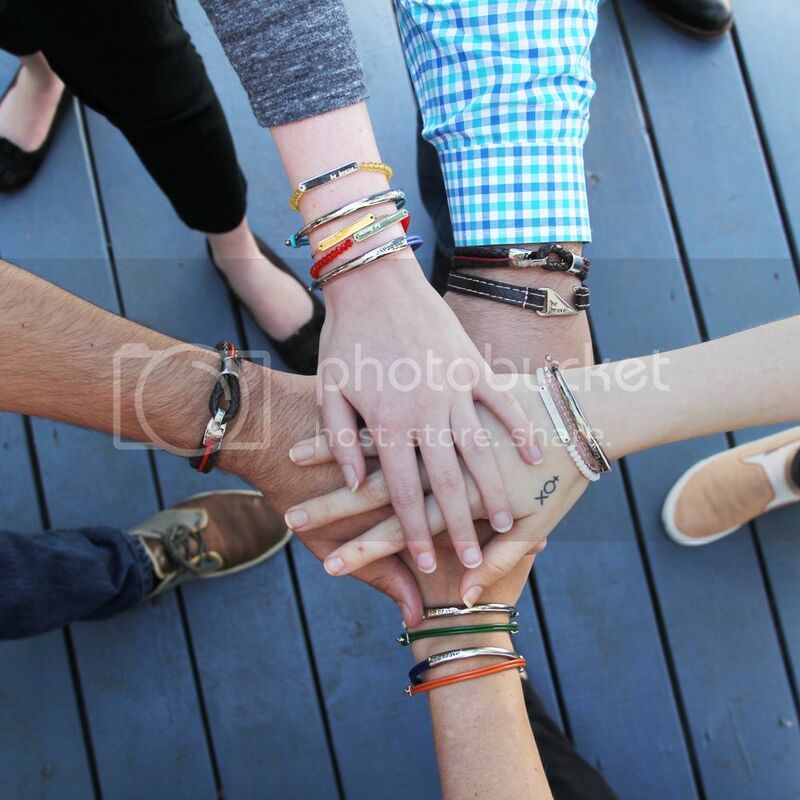 What advice do you have for fellow Brave Pages owners in having a successful donation experience with Bravelets? Of course, we love to profile Bravelets support in our quarterly newsletter and we have a Bravelets™ banner on our website's homepage at all times. That helps people to see, right off the bat, that is a way to get involved with us. I wear the jewelry. I get asked about it all the time. It's a great way to start a conversation. I am looking forward to sporting the watch around, I just got it in the mail the other day! People will say, "Gosh that's pretty, where'd ya get that?" That is a big part of it. Why are donations important for your non-profit? By having unrestricted funds, like those from Bravelets™, you can get the things you need. If you are a local organization or local shelter, people there might need something that isn't covered by the government or by formal grants. Maybe someone needs a new pair of shoes or new glasses. What is the best thing someone can do for NCDSV, besides donate? Encourage people to think about the way we CAN end domestic violence and sexual assault. Sometimes we can be so oblivious. Pay attention to the little things. If we interrupt the disturbing behavior and really pay attention to it, we can confront it. Little things: seeing a mother in a store with a crying child, and she is starting to lose her patience. You worry maybe she is going to hurt that child. It can be as simple as walking up and saying, "He is the cutest thing, may I hold him for a moment, and talk to him? Would that be okay?" This way you give her break, give her a minute to gain her composure and you show the child attention and love. Anytime we can interrupt the interactions that appear to contribute is helpful. You can help in a whole host of ways. People often regret seeing something and not saying something. Don't feel afraid; call 911, interrupt actions, be brave. What has been your number one key to success with NCDSV? Passion. Involving others who care very deeply about the ending violence and are willing to push for change. It was wonderful opportunity and a pleasure to be able to sit down with Debby and talk about her journey through supporting her cause. I hope I did this amazing woman justice! And I hope that this month you can stop and think about this cause, and ways you can support your cause! You can find the NCDSV Brave Page here and the website here.